Construction vs. Dundee graduation tradition? DUNDEE—With two months left until graduation, the Dundee school construction project of installing a new all-weather track and re-sodding the football field has created a question about where the graduation ceremony will be held at the school. 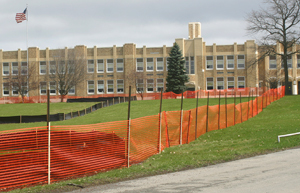 Superintendent Kathy Ring said the district will wait and see what the lawn looks like before deciding where exactly to hold the ceremony, June 24. Currently, areas where the graduates traditionally come down the hill and where the audience sits are fenced off. The work is part of a bigger project that includes interior work and facade improvements. Business Manager Melissa Lawson said the bulk of the outside work was scheduled to take place this summer. Athletic Director Chuck Mochamer said the football field work will be finished in September. However, he explained the re-sodded football field needs time to firm up before it can be used. Mochamer said this fall the football team will instead hold games closer to the school drive entrance, where the soccer team usually plays. Due to the track and field improvements, the school has even considered an offsite location for graduation. Glenora Wine Cellars offered use of its lawn for the ceremony. The senior class has already voted, 30 to 22, to not have graduation at the winery. The current work also includes stripping the topsoil from the track and football field. Workers are also excavating for the new transformer. The contractor will move onto grading and drainage of the track and field in May. Lawson said the focus of the work this summer will be on the high school. According to the estimated time frame, track installation and fencing will happen in early July and the new bleachers will be installed mid-July. Starting in August, workers will sod the football field and are expected install field event areas later in the same month. Meanwhile, main driveway paving repairs and sidewalk replacement will also happen starting in July. Other summer work, expected to be finished by August, includes completing fire alarm wiring, asbestos abatement, duct work, and flooring. The last scheduled work in 2011 consists of installing ceilings in high school rooms and corridors, and the driveway repairs. According to the plans for 2012, there will also be asbestos abatement in the elementary followed by new vents and flooring. Lawson said the expected completion date for the entire project is December of 2012.